You must be 21 and + to visit this site. Are you over 21 years old? Green Bench production capacity sits at 12,000 BBLs (372,000 gallons) annually. We produce our wort on a custom built, three vessel, 15 BBL Brewhouse manufactured by JVNW in Oregon. This configuration allows us to brew up to 90 BBLs of wort in a 24 hour span. In our main production facility we have 20 fermenters, two of which are 15 BBL tanks, and one is a custom built 25 HL Foeder that we use to ferment many of our Saisons on a house blend of wild yeast strains. The other 17 fermenters are all 30 BBL, allowing us to brew double batches to fill. In this facility we have 560 BBLs of fermentation capacity. Nearly every batch of beer that we produce is centrifuged. This process of clarification stabilizes our products prior to reaching the bright tanks. We have a GEA centrifuge that can transfer over 60 BBLs of beer per hour. For carbonation and packaging we have three bright tanks, two 30 BBL and one 60 BBL, giving us 120 BBLs worth of bright tank space. Our canning line was built by CFT, the industry leader in canning line technology, out of Parma, Italy. 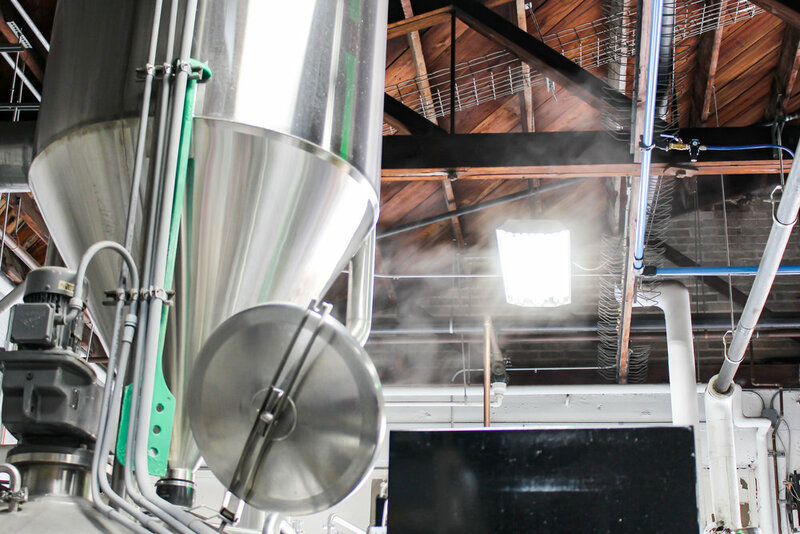 It fills up to 6,000 12 oz cans per hour, or 100 cans per minute, which gives us the flexibility to empty 60 BBLs in four hours, or all 120 BBLs in eight hours. We also have a fully operational laboratory on site that we utilize daily. Every day we pull samples off of every batch of wort that we produce for analysis, as well as every tank in fermentation. On fermenting beer we test pH, temperature, density, yeast cell count, and yeast viability to verify quality fermentations. When collecting and pitching yeast, we calculate the health and viability of our pitches and calculate to millionth cell what we add for fermentation. Once in the bright tank, we take samples of every beer and test for beer spoiling microbes, such as S. diastaticus, Brettanomyces, and hop resistant lactic acid bacteria (LABs). Only upon pass do our beers leave the bright tank for packaging to ensure that we have no contaminates leaving our facility. In addition to microbial beer spoilers, we test for dissolved oxygen in each beer in the bright tanks. Oxygen is also a beer spoiler that can ruin the aroma, flavor, and appearance of beer very quickly, therefore we have very strict pass/fail parameters built into our SOPs. Upon pass, we will keg and can our products, testing the dissolved oxygen and total package oxygen of the cans coming off of the canning line. Our CFT canning line has industry low oxygen pick up, which is the primary reason that we invested in this technology.